Mini Ceramic Birdbaths are a great way to teach two ceramic techniques in one lesson: pinch pots & hand building (2 class periods for the construction)! We made the bowl & base of the bird bath using the pinch pot method (we made the base by forming a ball, then pressing the clay around our finger to form a tall thin cylinder) and the bird is made using a hand building method. 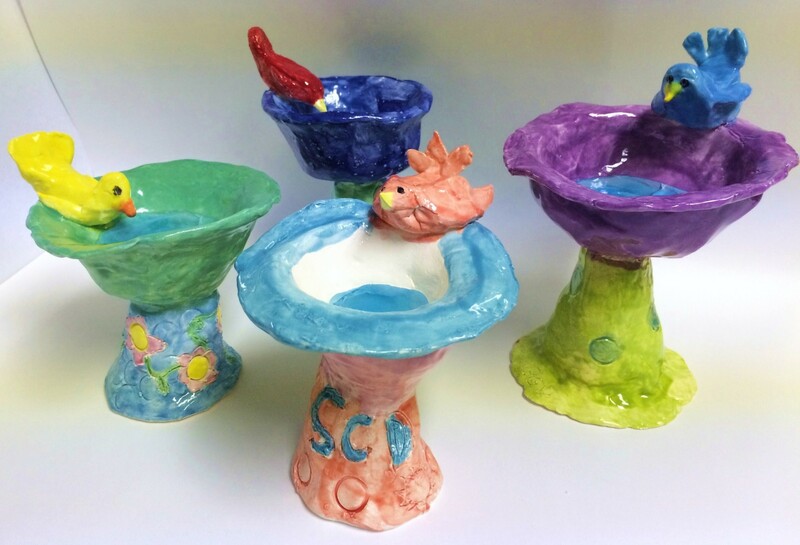 I first saw this lesson at these excellent art teacher blog Splats, Scras, and Glue Blobs Clay Bird Bath Sculptures Part 1 & Birdbath Sculptures with Melted Glass Water. SmART Class also has reference to this project. Many other art teachers have done this project with precious results! Parents LOVE this project! 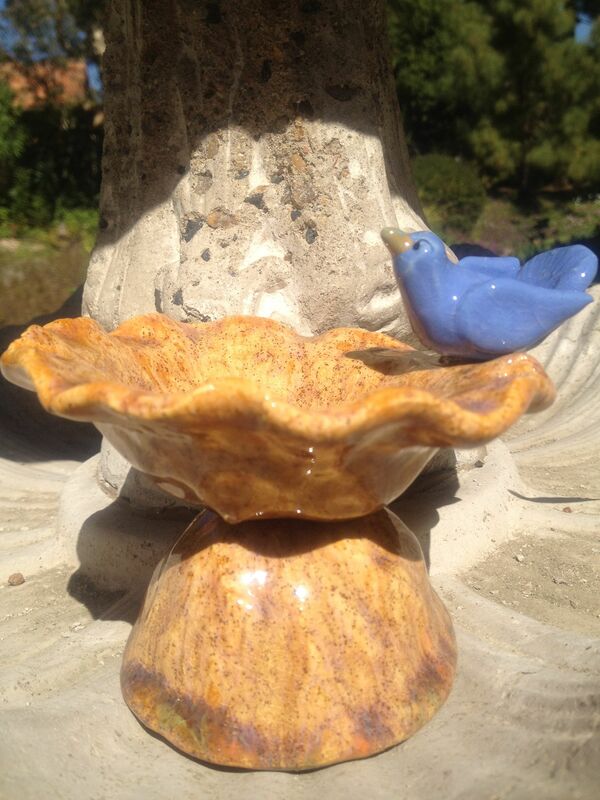 Construct a miniature bird bath and bird out of ceramics using pinch pot and hand building methods of construction. Give each student a bat with plastic wrap on it. Have the write their name on a piece of masking tape & put it on the front corner of the bat. Also give them a large plastic bag and rubber band for storage. Give each student two balls of clay one for the bath and one for the base or the stand. Create the bath with a small ball using the pinch pot method, form it into the desired shape of the bath. Create the base or stand by forming the other ball into a tall thin cylinder. This time after pulling out your thumb, insert your pointer finger & gently squeeze the clay around you finger until you have an even thickness all the way around the finger & it makes a tall cylinder. Wiggle your finger until it comes out & tap the open end on the table to that is even & not wobbly. Score & slip the bath & base together. Use a needle tool to draw patterns or other objects to press in texture (like the end of a marker cap). Use hand building techniques to form the bird. Cut the wings with scissors & gently sculpt them into the position you want. Score & slip the bird onto the bath. Let dry 5-7 days, Fire, Glaze -Add 3-5 glass beads & re-fire. If you use any of my images or text, please link back to my blog Create Art with ME! We fired at cone 06for medium speed because that’s what our glazes were supposed to be fired at. The glass beads were just cheap floral beads/marbles that we put in the birdbath for the glaze firing-it is NOT an extra firing. thanks, so if i already fired once they glazed, and did not put marbles in, then i can’t refire? Sandra, I believe you can add the marbles/glass after you have done the glaze firing BUT just to be sure I would do a test piece before hand! Don’t want to mess up all those precious pieces!